"My sister has a french au pair, we let her translate our web site." Translation is not child's play. Visitors to your web site or readers of your brochures will not be impressed by a poor or badly-worded translation. Professional translators regularly save their clients money by cutting out the superfluous and irrelevant text and by adapting the same so it is market-relevant. 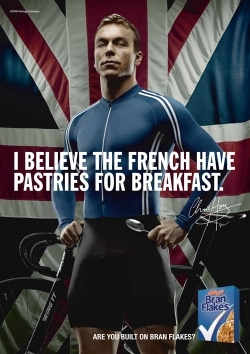 This excellent tongue-in-cheek ad (Used with the kind permission of Kellogg's) for Bran Flakes using Sir Chris Hoy would not necessarily be adapted to the french market, whereas in the UK we find this amusing. Are you looking to either expand or improve your sales in France, but how well do you know the French ? Do you know how they might react to an inadapted ad or a few out-of-place words or equally a poorly-worded translation ? poor communication will cost you dearly. You may have spent weeks, sometimes months, putting together your marketing plan perfectly adapted to the anglo-saxon market, more's the pity that you have not applied the same efforts when it comes to prospecting in foreign markets. Photo Bran Flakes ad : Used with the kind permission of Kellogg's.